NIOSH has become aware of a counterfeit N95 Respirator on the market. 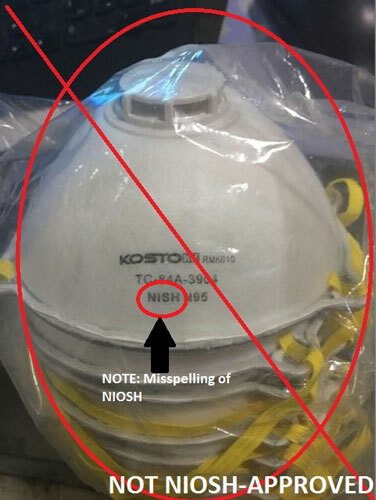 While the TC number and private label holder (KOSTO) are valid, this unapproved unit can be identified by the misspelling of NIOSH on the front of the respirator. How can you be sure your respirator is truly NIOSH-approved? Check the respirator approval markings or Certified Equipment List. Additional information is available on the NIOSH Trusted Source Page or by calling 1-800-35-NIOSH.